Out of 20 entries, Ian Bullock came fifth. This being an Olympic year for Great Britain, it would be a shame for Sutton Coldfield Fencing Club not to send some of their blades to the Olympics. However since the wildcard applications were sent in late they had to make do with the Wenlock Olympics instead or as it is known internationally the 126th Wenlock Olympiad. For those who do not know this multi-disciplinary Olympics is held every year in the leafy Shropshire village of Much Wenlock, and has been running for longer than the Modern Olympics and was one of the inspirations for its founder Baron De Courbertin who visited the town in 1891. While in the past it included such athletic events as shin kicking and wheel barrow racing, today it is a modern sporting competition with athletes from all over the country taking part in everything from road cycle races to archery to Swimming, and yes fencing a foil competition being run there for over thirty five years. This year club veterans Gavin Rudge, Julie Foster, and Gianfranco Muresu made their way there.The Pool stages started rather well for the trio, with Gavin doing exceptionally well, coming out of the two pool rounds ceding 2nd in the whole men’s competition. Julie defeated most of her opponents, while Gianfranco after an initial slow perhaps overcautious bouts ceded 12th. The competition progressed nicely and was well run, as the Wenlock open seems always to be. It had been a number of years since any of the Sutton fencers had been to the competition, but it was as enjoyable as ever, perhaps more as this year there were more curious onlookers, film crews and interviewers hanging around the place, Gavin even getting into a long conversation with a Japanese Film Director over the differences between Western Fencing and Japanese Kendo. Gavin who on the form of his ceding was given a bye past his first round, but his first direct elimination was against Steve Potter of dreaded “Squirrels”, otherwise known as Stourbridge fencing club, Sutton Coldfield’s South Birmingham rivals. Steve Potter, is one of the nation’s top veteran sabreurs, but had decided to swap his club…sorry, sabre to participate in the more elegant and refined discipline of foil. Despite it not being his weapon of choice, Steve made Gavin pay dearly for every touché, not giving Sutton’s wily fox the ability to settle within his slow measured game and distance control. The DE settled at 14-14, with Gavin losing the final after gambling that he could out-sprint a sabreur to a single direct attack. Julie on the other hand had a rather comprehensive morning in the pool stages. Although she won the event in 2007, this year, she struggled with a stomach bug (possibly caused by a meal cooked by said Gavin Rudge) and crashed out in the DE. This left Gianfranco, who up till then had a mixed morning grinding out wins in the pool stages against tough opponents, but losing a crucial fight and hit indicators against adversaries he normally not struggle with.The DE stages pretty much progressed in the same way, with Gianfranco gritting his teeth and grinding out results to get into quarter finals. However his point control had been questionable all day, unable at one point to convert any of his parries into on target ripostes in a single 5 minute period. 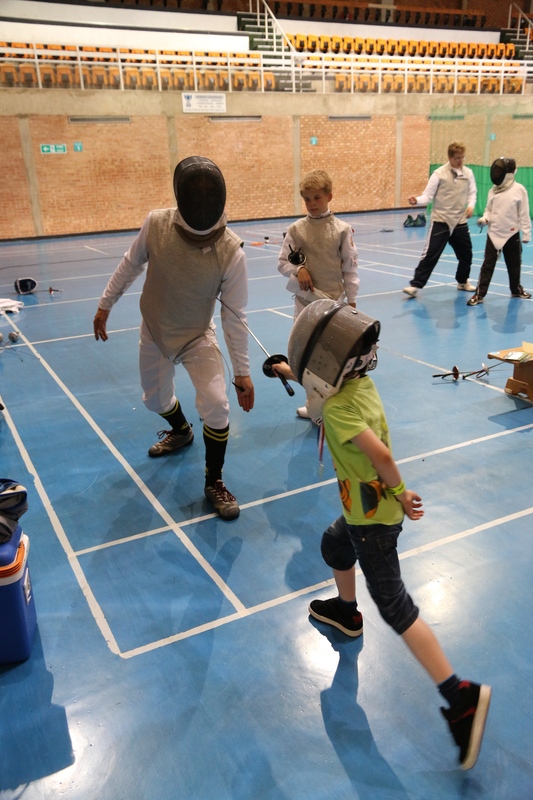 In the end he eventually lost against the number one cede and eventual bronze medallist, a neat and well contained attacking fencer. After taking an optimistic three point lead, he started to succumb to a barrage of well-timed step-lunges and remises, with Gianfranco’s point control rusty after over a year out of any competition, he simply could not find a riposte on his opponent. Despite a late rally, Gianfranco bowed out in the quarter finals 9-15. So sadly this year, Sutton was unable to steal a Gong from the Competition. Charles was our sole representative at the championships, but he made up for a poor showing from Sutton by gamely entering both the foil and Sabre event and came a respectable 6th place in both. Once again, Julie Foster took part in the Inter-county Excalibur competition as part of the women’s foil team. Gavin Rudge was down as reserve but found out at the event that he was now an essential part of the men’s foil team. This rather ruined his plans for the day which consisted of sitting in a pub somewhere with a beer and newspaper. However, as always, a good time was had by all and this year, Warwickshire came 5th overall.